Our big 50% Off Holiday Sale starts now! And new 2015 Catalog too! Yep, it’s the holiday season once again, and we’re offering our customers 50% off all comics-related books and magazines! The sale runs through December 1, but a word of warning: we WILL get behind on shipping by the end of November due to this sale. So order as early as possible. AND: You can download our interactive 2015 CATALOG (in PDF format) at this link! The sale is for in-stock PRINT books and magazines only. Digital editions, subscriptions, and bundles are not included. This entry was posted in TNT on 7 November 2014 by Mr. Morrow. 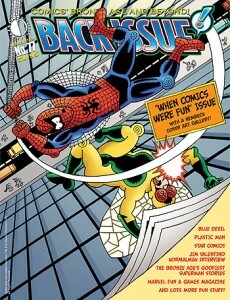 Editor Michael Eury takes us back to the days when comics were fun (remember those?) in Back Issue #77, which ships this week. 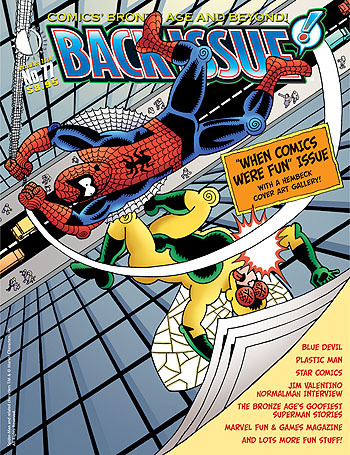 Stuff like Plastic Man, Blue Devil, Star Comics, normalman, goofy Superman stories of the Bronze Age, and more are spotlighted, in an issue that’s sure to make even the most jaded comics fan smile. You can find it here. This entry was posted in TNT on 3 November 2014 by Mr. Morrow.